Common stinging nettle (Urtica dioica) is a perennial plant found in temperate regions throughout the world. Often maligned due to its painful “stings,” stinging nettle is actually a flavorful, high-protein superfood with a long history of use as a culinary, medicinal, and fiber plant. By the end, we hope you’ll see why (and how) you should grow your own stinging nettle! An early spring harvest basket full of stinging nettles at Tyrant Farms. In every temperate region around the world, there lives a plant both beloved and reviled: stinging nettle. Nearly every culture has quips, jokes, and insults involving stinging nettles. Why does granny need to worry about nettles? 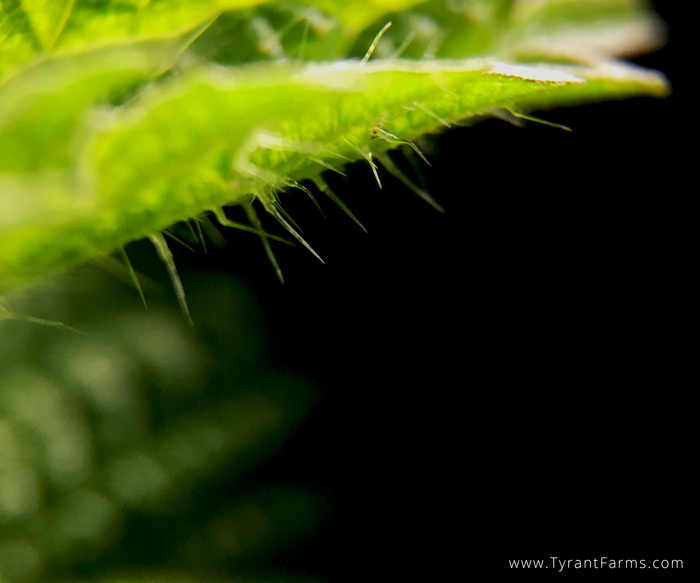 The tiny stinging hairs (trichomes) on stinging nettle leaves are enough to make granny very anxious. As the name implies, stinging nettles do in fact sting. If you’ve never brushed against a stinging nettle plant, count yourself lucky. I’ve been stung by both nettles on land and jellyfish in the ocean, and the stings are comparable in the level of pain they cause and the welts they leave on the skin. There’s another side to stinging nettle though… Despite its painfully defensive exterior, it has the potential to be one of the most beneficial plants for humankind and our little blue spaceship. 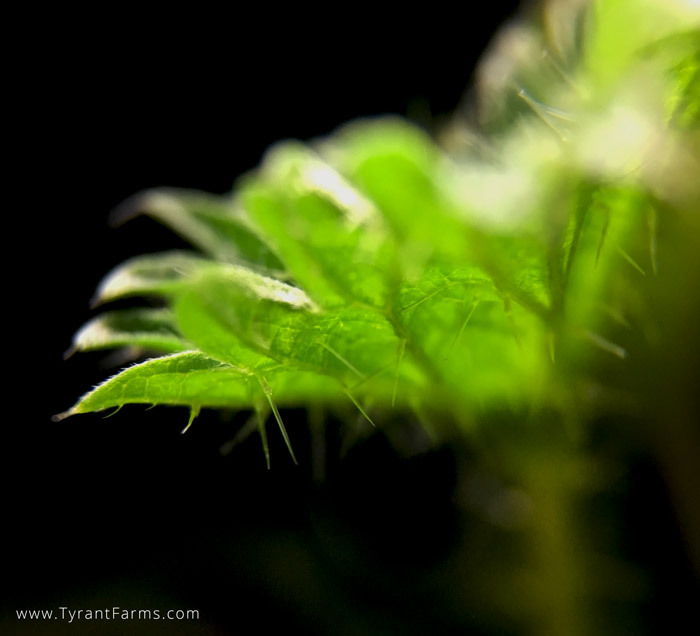 A closer look at a dense cluster of stinging nettles emerging in late winter at Tyrant Farms. See all those tiny hairs? Those are trichomes made of silica, and they contain compounds that pack quite a sting. Human food – As it turns out, stinging nettle is not just edible, it’s also high in protein and among the most nutrient-dense greens in the world. Animal food – Raw stinging nettle doesn’t tend to be a highly coveted food by animals due to its stings. However, once the plant is dried, its stinging capacities are neutralized. At that point, it makes an excellent high-protein forage comparable in quality to alfalfa, and is great for supplemental livestock feed. Medicine – Stinging nettle has been used for thousands of years by various cultures to treat a wide range of ailments. Modern science is beginning to corroborate the efficacy of some of its traditional medicinal usages. Fiber – Stinging nettle is an excellent fiber plant that’s easy to grow organically (unlike cotton) and can be used to make clothing and other fabrics. It’s also a perennial plant that’s easy to grow without soil tillage. Pollinators and other beneficial insects – Stinging nettle flowers are wind-pollinated, not insect-pollinated. Nevertheless, stinging nettle is a host plant for a number of butterfly and moth species. It also provides great perennial habitat for a wide range of other beneficial pollinators and predatory insects, from native bees to parasitoid wasps. An overhead view of a stinging nettle patch starting to break dormancy. The light brown stalks are last year’s dead stems, which die back to the ground during the first deep freeze of fall/winter. Ho do you identify stinging nettle in the wild? What does stinging nettle look like? Location – Stinging nettle typically grows wild in moist, nutrient rich soil on forest edges or alongside paths. It can grow in both full sun or part shade. Our main stinging nettle patch is thriving with about 4 hours of direct sunlight in the summer. Growth cycle – Stinging nettle emerges as soon as the ground thaws in late winter or early spring. Stinging nettle dies back to the ground at the first hard freeze of winter. Since it’s a perennial, it comes back in the same spot year after year, spreading via seed and underground runners. Leaf shape and structure – Stinging nettles feature serrated leaves, with a rounded base and a pointed leaf tip. The leaves have a multitude of fine stinging hairs that are mostly concentrated on the underside of the leaf. Stems – Stinging nettles have square stems similar to plants in the mint family (they are not in the mint family, however). Stinging nettle looks almost identical to catnip, which is in the mint family. Flowers – In summer, stinging nettles can reach 3-4 feet in height and each stem can produce clusters of tiny white, green, and yellow flowers. The flowers are wind-pollinated, not insect-pollinated, so they don’t produce any scent that would help to attract pollinators or smell good to humans. The male flowers are at the top of the plant and explode pollen into the air, which then dusts lower-lying female flowers. 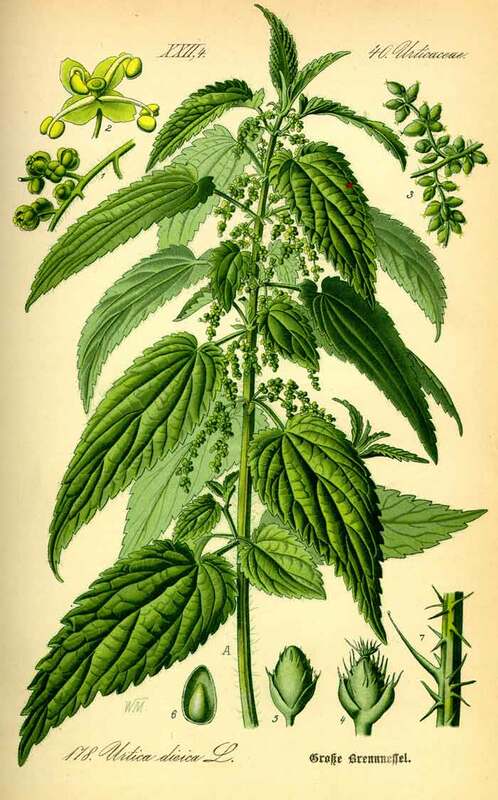 Stinging nettle (Urtica dioica) from Thomé, Flora von Deutschland, 1885. What causes stinging nettle to sting? Plants can’t punch, kick, run, scream, or throw a spear. 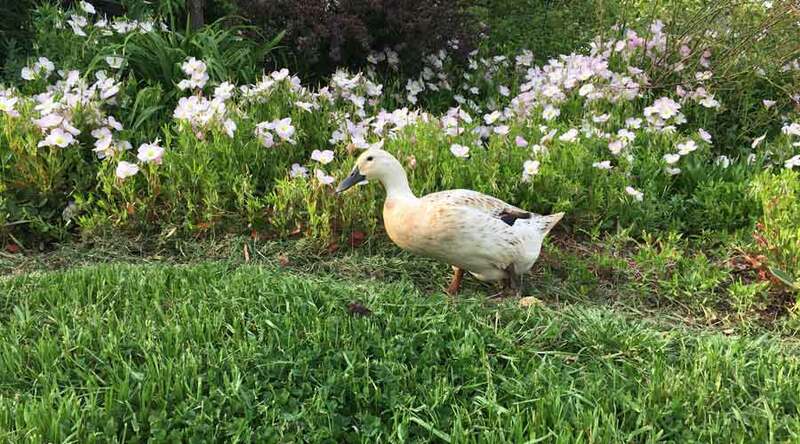 Thus, to defend themselves from being eaten, they’ve developed a wide range of remarkable adaptations to make their essential parts less appetizing to things that want to eat them. 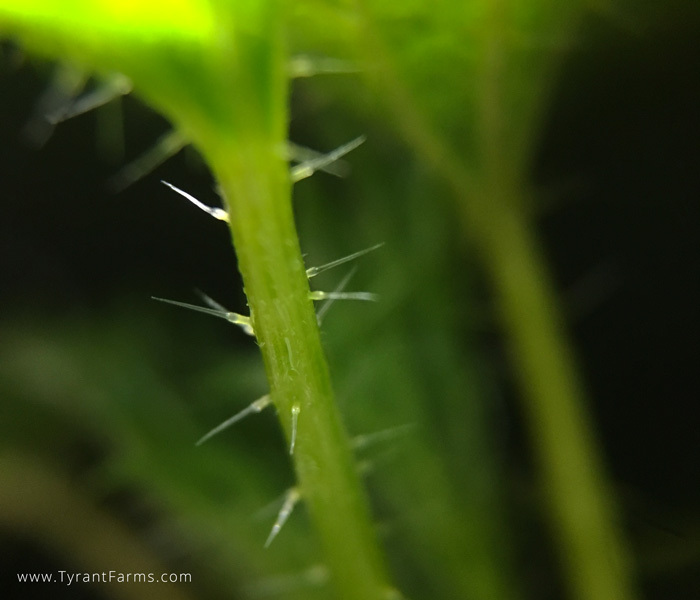 A closer look at stinging nettle trichomes on the stem of the plant. These tiny hairs and the compounds inside them can cause a very unpleasant sting and rash. The fun doesn’t stop there though. Inside the stinging nettle’s hairs are a range of chemical compounds that synergistically cause the stinging sensation and skin welts. The primary culprits: histamine, acetylcholine, and serotonin. Imagine dozens of near-microscopic hypodermic needles injecting you with liquid discomfort. Yes, there are ways to make stinging nettle stop itching (read below). How long does a stinging nettle’s sting last? Left untreated, a stinging nettle sting usually lasts 2-3 hours. However, like the visible rash the stingers cause, the stinging sensation can last up to 24 hours in some cases. II. How do you treat a stinging nettle sting? 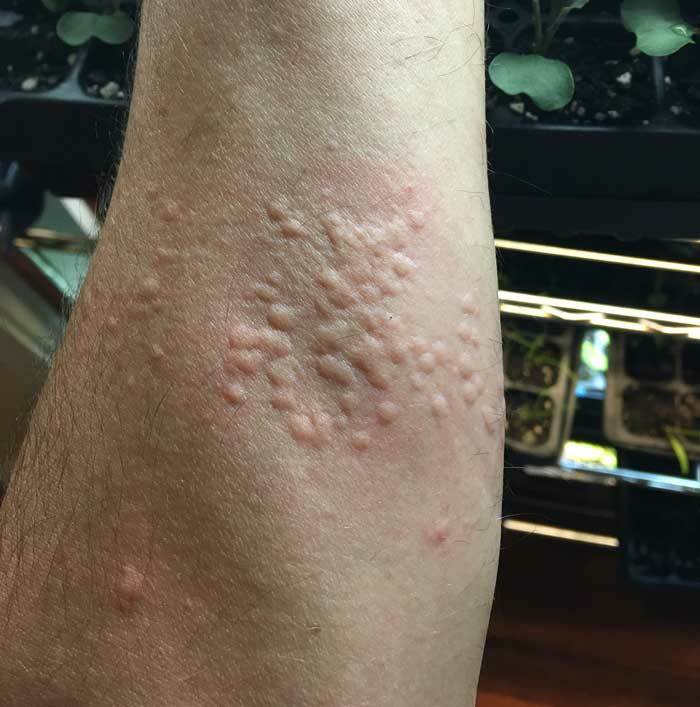 I’ve been been stung countless times by stinging nettle patches growing in our yard, and have developed a tolerance to the painful effects. Nevertheless, it’s good to have countermeasures in place in case someone else gets stung. The sacrifices I endure for you people… Yes, I intentionally stung my arm with stinging nettle for this photo. I also did it so I could start testing various remedies to see which one works best. Each time I try a new remedy, I’ll update this article. Each remedy is said to be an effective treatment for stinging nettles. For the sake of science and humanity, I’ll intentionally sting myself, try each treatment method, then report back on the results! 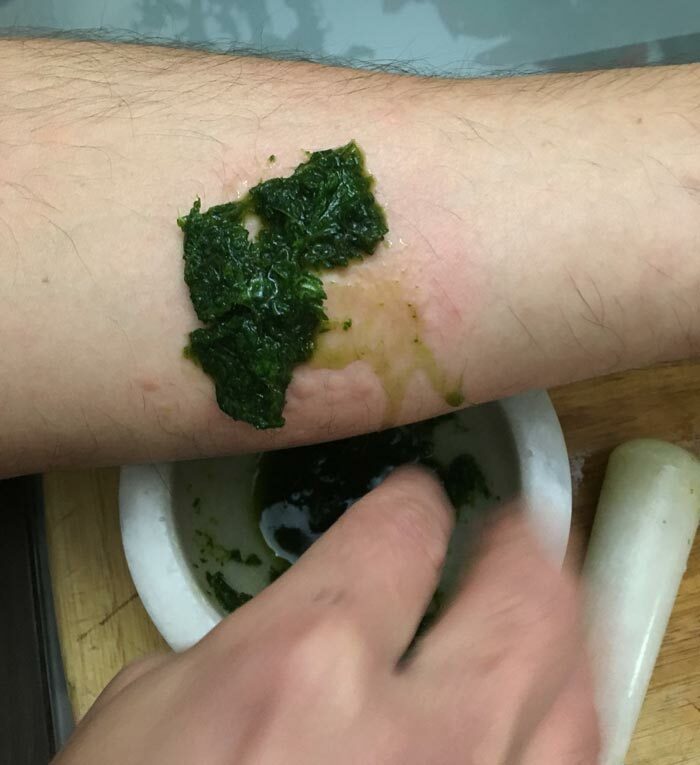 Experiment 1: Does stinging nettle juice stop stinging nettle stings? Hypothesis: Stinging nettle leaves contain compounds that neutralize their own sting. Pulverized stinging nettle and stinging nettle juice being applied to the nettle sting. I applied the plant juice/paste to the effected area about 5 minutes after the initial sting, then let the paste sit on the sting for 10-15 minutes. After 15 minutes (once the paste/juice completely dried), I washed off the area with cold soapy water using a dish cloth. I scrubbed in a single direction, rather than a circular motion, with the aim of pulling the stinging hairs out. About 45 minutes later the spot felt warm and tingly, almost like it had icy hot on it. Strangely, about 60 minutes in, the stinging sensation came back and persisted for a couple more hours, albeit less intensely than the initial sting. Perhaps continued applications of nettle juice are required to make this method continue to work. Experiment 2: Does plantain (Plantago major) stop stinging nettle stings? Ouch! 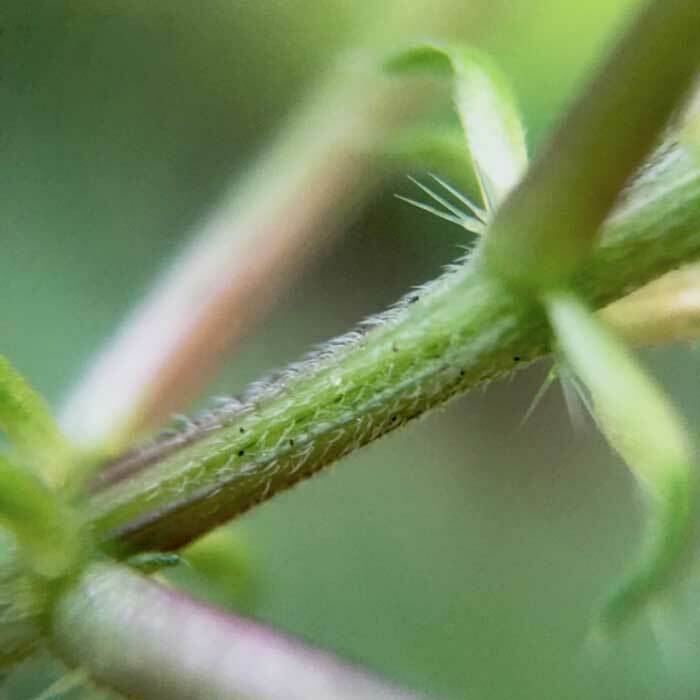 Closeup up of the stinging trichomes along a stinging nettle stem. Is it safe to eat stinging nettles? After reading the information above, you may have lost your appetite for stinging nettles. Worry not! They are perfectly safe to eat. Stinging nettle is so easy to grow that one might argue it’s too easy to grow. Like mint, it aggressively produces underground runners, so a small patch of stinging nettle can quickly become a large patch if proper precautions aren’t taken. Soil – Place your stinging nettle in a spot with moist fertile soil for best results. Sun – Stinging nettles can grow well in full sun or part shade. As mentioned previously, our main patch is thriving in a spot that only gets about 4 hours of direct sunlight in the summer. It’s growing as an understory to pawpaw trees to help keep unwanted mammals from raiding our fruit. Containment – You probably don’t want a garden full of stinging nettle. To avoid that outcome, grow stinging nettle either in containers (like a grow bag) or in a bed that’s cut off by concrete walkways or other hardscape features that will keep it from crawling beyond its intended areas. Additionally, you may want to cut the plants back vigorously before they set seed to prevent them from spreading via seed. Don’t let the small size of this plant fool you: stinging nettle can rapidly spread in your garden if not properly managed! Stinging nettles require virtually no maintenance. We top our bed up with a few inches of mulch each winter when the plants are dormant. This helps improve soil fertility and maintain soil moisture, which the plants love. The plants pop right through the mulch in late winter each year, then freeze back to the ground at the first hard freeze in late fall. Our stinging nettle patch didn’t love it, but it survived a “150 year drought” without irrigation a few summers ago where we didn’t have any summer rain for over 3 months. If you live in a spot without regular rain and you want to keep your stinging nettle plants happy, make sure they receive about 1″ of water per week. How do you get rid of stinging nettle plants in your yard or garden? Lets say you have small children or pets and you want to get rid of your stinging nettle. What to do? Mowing or weed-whacking won’t do the trick — in fact, these methods will likely make the stinging nettle grow back more densely. 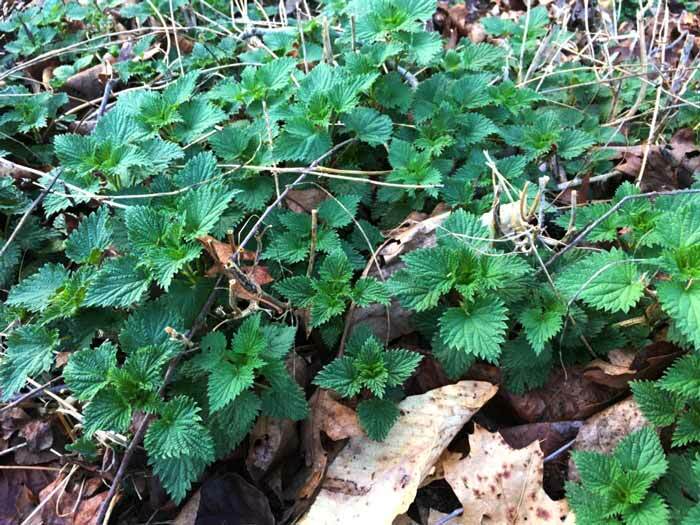 Synthetic herbicides are horrid for the health of your ecosystem and present a far greater risk to the health of your pets and children than stinging nettle does. Instead, your best bet is to put on gloves and a long sleeved shirt, and pull the plants out completely, roots and all. Since stinging nettle plants spread by root runners, this can be hard to do. To help ensure that the stinging nettle doesn’t grow back, use a modified version of “sheet mulching.” Start by covering the spot with a layer of cardboard, then place 4-6″ of wood chips on top of the cardboard. The cardboard will help prevent any remaining nettle roots from sending leaf shoots back to the soil surface to photosynthesize. The wood chips weight the cardboard down and also serve as an additional weed blocking layer. Within a year, the cardboard will be completely decomposed and the wood chips will be almost entirely decomposed as well, leaving behind rich, black soil ready for new plants. How do you harvest stinging nettles? 1. Carefully, and 2) In late winter-early spring when the growth tips are most tender and flavorful. It’s a good idea to wear thick gloves when harvesting stinging nettle to avoid these stinging trichomes. Experts can harvest stinging nettles bare-handed, but we advise you to wear gloves. The best parts of the stinging nettle are the tender 3-5″ growth tips. Hold the tip with a gloved hand, snip the base of the growth segment, toss it in your harvest basket, repeat. Like all greens, stinging nettle greens are mostly water so they’ll cook down considerably. Be sure to harvest enough for whatever recipe you have in store. We’ve read that you don’t want to harvest the stinging nettle once it starts producing seeds because the plants supposedly develop calcium carbonate crystals that can cause urinary tract irritation. We’re not sure if that’s true, but we haven’t felt like testing that claim on ourselves. It’s probably best to err on the side of caution and avoid eating later-season stinging nettle after it’s begun to flower. A harvest basket full of stinging nettles (bottom) at Tyrant Farms. What do stinging nettles taste like? Raw stinging nettles offer a refreshing cucumber-like flavor. When eating raw nettle leaves, note that most of the needles are on the underside of the leaf. Therefore, each raw leaf should be rolled and folded in on itself before chewing. Chewing crushes the needles and also releases the juices in the leaf – both of which neutralize the plants stinging potential. Cooked stinging nettles offer a spinach-cucumber flavor. Perhaps because they’re relatively high in protein, the cooked greens do have more of an umami flavor than other greens. 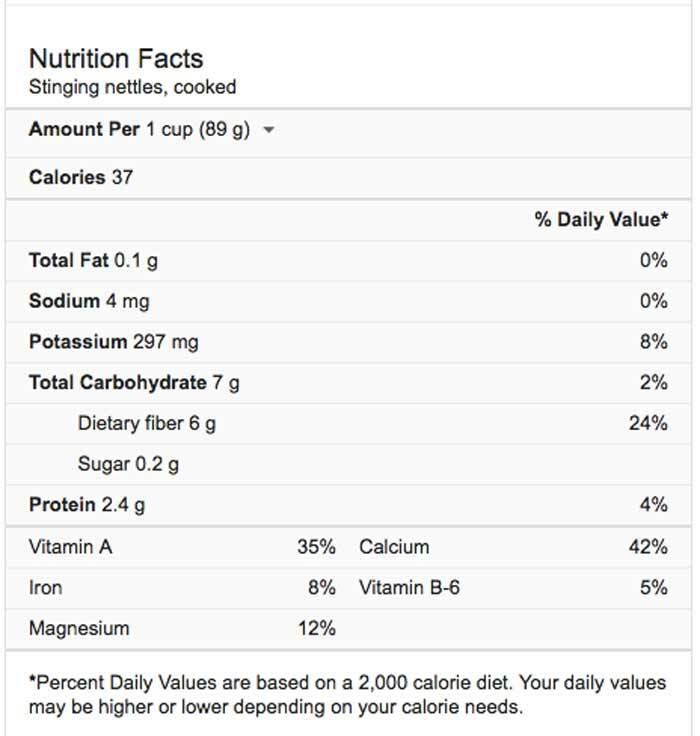 What’s the nutritional value of stinging nettles? Stinging nettles supply a high amount of protein, fiber, macro and micronutrients. How do you cook nettles? Cooking, steaming, or blanching stinging nettles in hot water completely neutralizes the plant’s stinging capacity. That’s why you should cook stinging nettles rather than eating them raw. Our favorite use of cooked nettles is to make soup (we jokingly call it “Incredible Hulk Soup” due its bright green color). Recipe coming soon! 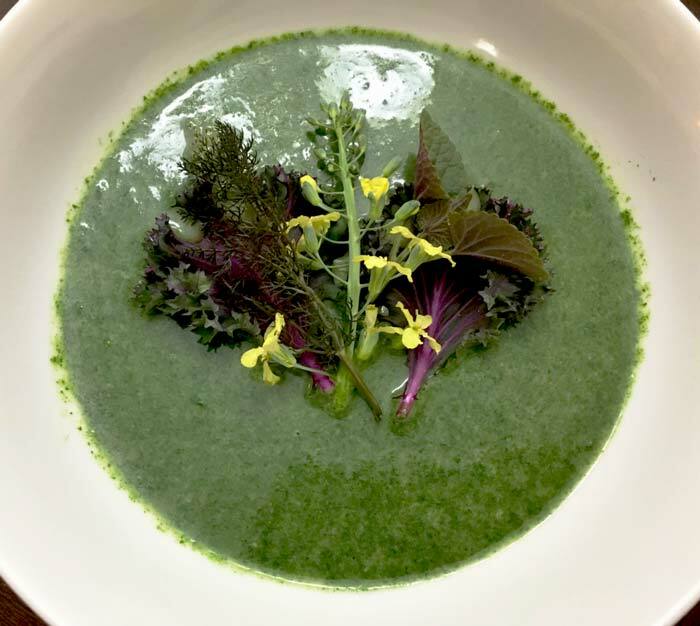 Stinging nettle soup (aka Incredible Hulk soup) topped with garden-fresh hyssop, purple kale, bronze fennel, and flowering broccoli florets. Stinging nettles are used in a wide variety of recipes from around the world, so use your googler for inspiration. Another popular use of stinging nettle is to make stinging nettle tea, which tastes wonderfully fresh with notes of cucumber. Stinging nettle has a long history of being used as a tradition medicine around the world. Here in the US, the Native American Ethnobotany Database shows just how extensively nettle was used by indigenous populations. Traditional medicinal uses for stinging nettle include: rheumatism, kidney and urinary tract disorders, stomach aches, hair loss, allergies, muscle and joint pain, and treatment of a wide range of skin ailments. Does modern science show medicinal benefits of stinging nettle? 1 pound bags of dried organic nettle leaf to make into whatever you want. We grow and use stinging nettle because it’s a delicious seasonal food that we look forward to eating in the late winter and spring each year. The fact that it has medicinal applications is just an added bonus. 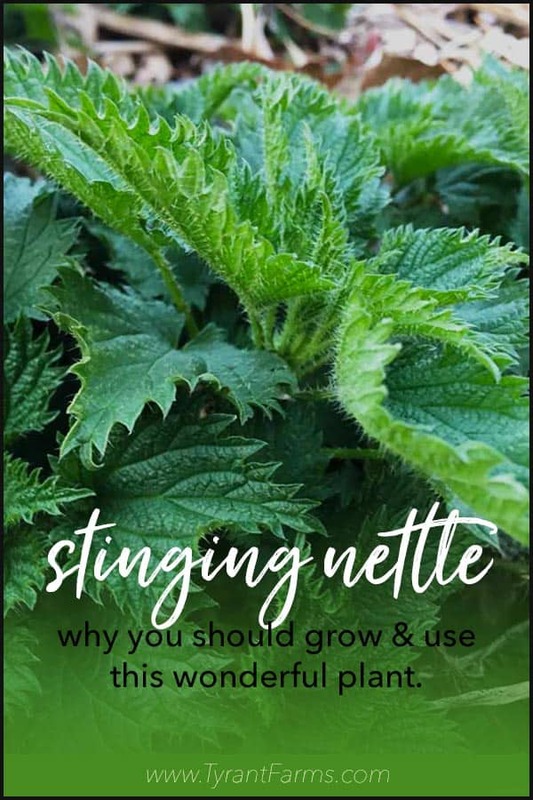 We hope you found this article about stinging nettles interesting, informative, and helpful!